If you are lucky enough to be taking a vacation to the beach, you may want to throw in some books for the beach. If you are afraid of having sandy and wet books at the beach, think about packing a few beach books for bedtime or a rainy, stormy day at the beach. Can't head to the beach? These books could also be used in a preschool beach unit. Preschool children love to create the ocean animals that they read about in books. The beach provides lots of items children can categorize and count. And the books about the beach allow for fun book activities! 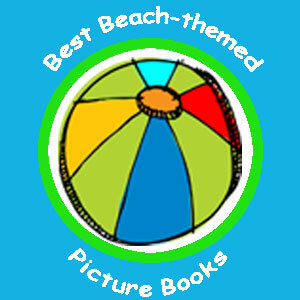 Here are a few of my favorite beach themed books for babies, toddlers, and early readers. Hooray for Fish by Lucy Cousins takes readers underwater to count, name colors, rhyme, and find new fish friends. The fish in this ocean are unlike any you've seen. There are big, bright red fish, blue fish, and yellow fish. There are hairy fish, scary fish, twisty and twirly fish too! Another great rhyming text about the beach is Sea, Sand, Me by Patricia Hubbell. This is a simple story about a girl's day playing with a little boy at the beach. The repetative text encourages the littlest learners to participate. The large, bold illustrations make this a perfect book for taking a picture walk. Flip through the pages while you talk about all you can encounter at the beach. He's a Pout Pout fish. He's destined to be dreary, or so he tells every other fish in the sea. The Pout- Pout Fish in Deborah Diesen's book, tries to stay glum but a new fish swims on the scene in this book and helps him find his true destiny, "spreading cheery cheeries" This would be a fantastic book for a rainy day at the beach when everyone is stuck inside! In this story, Mrs. Clam yawns and the pearl in her shell falls out into the ocean. The pout-pout fish wants to help Mrs. Clam recover her pearl but realizes he is too scared of the dark to go in the deep dark parts of the ocean. This book begs to be read aloud.It is coupled with fantastic illustrations that are both cartoonish and very detailed. Your child will want want to hold the book himself and study these illustrations for a while. This is a wonderfully written and illustrated book with a postive message about overcoming our fears together and helping our friends. Stella Star of the Sea by Marie- Louise Gay In this Stella and Sam book, the brother and sister visit the beach. Stella dives right into the water, Sam dives right into a million questions about the sea. Stella answers them all with a imaginative twist. Finally, Stella gets the chance to ask what she has been wondering all along, "Sam, are you ever coming in?" There are a lot of great opportunites for learning new ocean vocabulary words in this book. Speaking of vocabulary, Swimmy by Leo Lionni introduces a huge array of vocabulary in a preschool friendly book. In this Caldecott Honor book, Swimmy is the only little black fish in a school of little red fish. One day, Swimmy's entire family of fish gets swallowed up by a big tuna fish. Swimmy is all alone in the ocean. He swims off and meets a medusa of rainbow jelly, a lobster, sea anemones and more! (This is where you get to introduce all kinds of ocean vocabulary). In the end, Swimmy meets a new group of little red fish. These fish are more cautious and fearful of swimming in the ocean, until Swimmy comes up with the perfect plan. The problem is solved when Swimmy uses his unique color to create a solution. Ten Little Fish by Audrey Wood and Bruce Wood. This is an adorably illustrated book focused on counting backwards. The book begins with ten little fish. Slowly, they wander into other adventures or find new friends until only one fish is left. Luckily, he finds a "friend" and soon one becomes a mother and the other becomes a father. I bet you can't get how many kids these two have! The Deep Blue Sea a Book of Colors is another concept book by Audrey Wood and Bruce Wood. This book gradually zooms in on a rock on a tiny island and introduces one new tropical item at a time to the scene. It also introduces a new color word each time. After spending a day at the beach watching your child encounter ocean waves, come inside and read "Wave" by Suzy Lee. This is a wordless picture book about a girl's day at the beach. The girl and the wave play back and forth until the girl ends up wet and a new "friendship" with the ocean is formed. Do you like to people watch at the Beach? Then Beach by Elisha Cooper is the book for you. This wonderful read aloud for early readers, shows the normal happenings at a full day at the beach. The illustrations are small and have several to a page. This beach book would be best enjoyed by older readers who would probably pour over the pictures and the illustrations. Flotsam by David Weisner In this wordless picture boy goes to the beach to look for flotsam- things that float up on shore. Surprisingly, an old underwater camera floats up. He takes the film to have it processed. The camera reveals images of fantasy-based underwater world. As he flips through all of the underwater life, he stumbles on another suprise. He finds the camera has also traveled around the world for many, many years past and has recorded photos of children. These photos of children around the world from the past, create a timeline of the camera's journey. Henry and Mudge and the Forever Sea by Cynthia Rylant is a wonderful first chapter book early reader about the beach. In this short four chapter book, Henry, his dog Mudge, and his father take a trip to the ocean. A typical day at the ensues. This is a great choice for children who are new to chapter books. You can introduce the text features of a table of contents and chapter headings, while still enjoying a story that could be read in one sitting. Henry and Mudge is good for independent reading or as a read aloud for preschoolers. Scaredy Squirrel at the Beach by Melanie Watt If you are looking for a little ridiculousness on the beach, make sure you read Scaredy Squirrel at the Beach. If you've read any of the other books in the series, you know that Scaredy Squirrel doesn't like to venture out into the unknown. This scared little guy decides to create a beach in his own backyard instead of going to the real "scary" beach. His beach is almost perfect until he realizes he is missing the soothing sound of the ocean's waves. Now Scaredy Squirrel must find a plan to get to the beach without encountering anything strange, scary, or unusual. As you might guess, his plan doesn't quite work out, but his fear of the beach is eased. We've been having a lot of fun with some beachy-activities to go with our beach and ocean themed books. 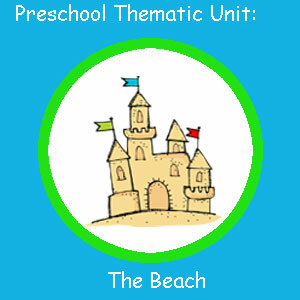 I've compiled all of our activities, crafts, literacy and match centers, and early readers in a preschool beach unit. This packet can be purchased at my Tpt store! What a fun collection of books - and we've only read a couple of them! Jackie - I LOVE your list of beach books! Pout Pout Fish - I so remember that book, the kids really liked that one. That's a great collection of beach themed books, perfect for the holiday season. Beach by Elisha Cooper tells everything anyone could ever do at the beach in one book. The hundreds of drawings really help you remember all the fun things possible at the beach. The other books you selected are also wonderful! I purchased your unit and am so impressed with your curriculum writing and illustrating skills. I love your round up of beach books! Anna loved "WOW Ocean!" by Robert Neubecker - a fun "look-and-find" book. Thanks for joining WMCIR! Swimmy is absolutely one of my favorites! I love swimmy too! Great, inspiring story. That is a super list. We have read a few of these and looking forward to read the rest!